If you (like me) move in liberal Catholic circles, you have quite possibly heard the refrain that the Genesis when properly understood, is not in conflict with science. The creation myth that we see in the chapter of Genesis, for instance, is to be understood as a myth, an allegory - a story told to teach us that God created us. It is only people who misunderstand the real purpose who interpret it literally. The catholic church's teaching is quite consistent with evolution and science. At least, that is the claim. Let's see how the claim stands up to scrutiny. The story of course is that God created Adam and Eve the man and woman on this earth. All of us are decedents of Adam and Eve. Adam and Eve disobeyed God's command and were banished from the Garden of Eden. This was the "original sin" which the Catholic Church teaches us, is passed on to all of us at birth. Therefore, just as sin entered the world through one man, and death through sin, and in this way death came to all people, because all sinned. To be sure, sin was in the world before the law was given, but sin is not charged against anyone’s account where there is no law. Nevertheless, death reigned from the time of Adam to the time of Moses, even over those who did not sin by breaking a command, as did Adam, who is a pattern of the one to come. The Jewish Roman historian Flavius Josephus in his work, "Antiquities of the Jews" (93 or 94 AD) recounts the history of the Jewish people up to the Jewish War. He starts with Adam and Eve and recounts the history as in the Hebrew Bible. Josephus was no Christian but he seems to have taken the Adam and Eve story quite literally. The gospel of Luke traces the genealogy of Jesus all the way back to Adam himself (Luke 3:23-38). 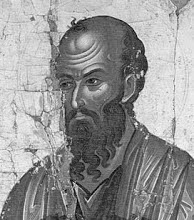 The pastoral epistles of Timothy and Titus are second century works claiming to have been written by Paul the apostle. 1 Timothy has this misogynistic passage which talks about a literal Adam and Eve. Augustine of Hippo (354 - 430) in "The Literal Meaning of Genesis" and his other works makes it clear that the creation account can not be taken completely literally. For God to say "let there be light" at the beginning of creation makes no sense, for instance. While Augustine could look for allegorical meanings, he clearly inferred a literal Adam and Eve. The Council of Trent (fifth session, 1545–47) in its decree concerning the Original Sin, insisted on a literal Adam and the original sin. Here is a sample. At the First Vatican Council (1869-1870), Pope Pius IX on his way to declaring papal infallibility, had this to say. I embrace and accept the whole and every part of what was defined and declared by the holy Council of Trent concerning original sin and justification. This assertion, rather than showing Catholic theology to be consistent with the theory of evolution instead suggests that they are rather inconsistent. The first man was not only created good, but was also established in friendship with his Creator and in harmony with himself and with the creation around him, in a state that would be surpassed only by the glory of the new creation in Christ. The Church, interpreting the symbolism of biblical language in an authentic way, in the light of the New Testament and Tradition, teaches that our first parents, Adam and Eve, were constituted in an original "state of holiness and justice". This grace of original holiness was "to share in. . .divine life". The doctrine of original sin is, so to speak, the "reverse side" of the Good News that Jesus is the Savior of all men, that all need salvation and that salvation is offered to all through Christ. The Church, which has the mind of Christ, knows very well that we cannot tamper with the revelation of original sin without undermining the mystery of Christ. While Catholics may not take all of the Bible to be literally true, while they have since the beginning of their religion seen allegory in some of the passages, the orthodox view has been to take Adam and Eve to be literally the first humans on this earth. To say otherwise is a massive rewrite of history. The Catholic romance with the theory of evolution is a very recent phenomenon. And as we see in what the Popes in the last century have said about it, this romance has been a very bumpy one. The theory of evolution tells us that humans evolved from more primitive primates such as the homo erectus over a period of time. There is no single point at which homo erectus turned into homo sapiens. There is no single parent, no single point to grow a soul and no single point at which the original sin could be committed. Without the original sin, the theology behind the sacrifice of Christ is called into question. Catholic theology is, most certainly in conflict with the theory of evolution. More importantly, Catholic theology over the centuries, as we have seen, considered Adam and Eve to be the literal first humans as revealed by the Bible. To say otherwise is simply, ignorance of Catholic history!